Do you remember what it was that got you interested in riding motorcycles in the first place? I used to see them in the streets and think that they would be fun while I was growing up, but what really got me interested was watching some stock footage of Evel Knievel jumping on ABC's The Wide World of Sports. Nothing brought more excitement to the world of motorcycles than watching Evel Knievel jump his. During his caree, Evel made it in the Guinness Book of World Records for bones broken, and he was watched by millions. Even if you thought he was crazy, you still had to admire his total lack of self-preservation while he attempted jumps across school buses and rivers. 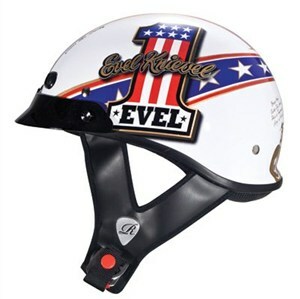 Well, as if to try and reconnect the little bit of Evel Knievel that lives in all motorcyclists, Rockhard Helmets has come out with a limited edition run of "Evel Knievel" graphic helmets. Each one comes with a numbered certificate of authenticity, but don't be fooled by its "collectible-ness" -- this is a full-fledged, DOT-certified half shell helmet. It comes with a 3-snap, removable visor and removable washable liner. The shell is made out of advanced fiberglass (making it lighter and stronger). Wear this helmet while riding, or hang it on the wall in your Evel Knievel room. Either way, it looks good.